Whether you live in Belfast and are looking for coach hire to anywhere else in Northern Ireland or you are organising a group trip or holiday to this exciting city, National Coach Hire can offer a relaxing, inexpensive and flexible service. If you’re looking for a coach service from Belfast, we can source the best quotes from the best operators in the city; if you’re heading to Belfast from elsewhere then we can offer coach operators with an in depth knowledge of the city and the surrounding area. Belfast is a wonderful place to visit nowadays, as the Peace Process and investment in infrastructure and business, restaurants and bars, have all created an atmosphere of optimism and change. Indeed if you’re heading to Belfast for its history then there is a sense of history currently being made amidst the remnants of the city’s earlier divisions. From the ‘Divis Tower’ to the Peace Line to Solidarity Wall and the Sinn Fein headquarters, there is still much to see from the city’s troubled past whilst simultaneously getting a sense of optimism for the future. If it’s history from a little further back you’re after then why not explore Belfast Castle or the Albert Memorial Clock Tower, or the extravagant City Hall? Then travel to Stormont Castle or St Anne’s Cathedral, or stop and have a walk around the beautiful Queen’s University. You’ll quickly realize that Belfast is a city steeped in history and historic buildings. Should you wish to go even further back, then check out the Giant’s Ring, a Neolithic ritual complex with a Druid’s Altar at its heart. Alternatively, why not explore Belfast’s industrial heritage, from the Custom House to the Conway Mill, a former flax mill that now holds a number of arts and crafts boutiques and shops? If you fancy something lighter, why not try Belfast Zoo, one of Europe’s more inspiring and spacious zoos, or Belfast’s Botanic Gardens, with the Palm House and the Tropical Ravine? Or if you want to mix a bit of culture with a taste of the craic, why not pay a visit to the Crown Liquor Saloon, an ornately decorated saloon bar, owned by the National Trust. If that gives you a taste for more, then Belfast has a varied and exciting nightlife, from the massive and newly built Odyssey Complex to the eclectic and ever increasing selection of bars, clubs and restaurants. 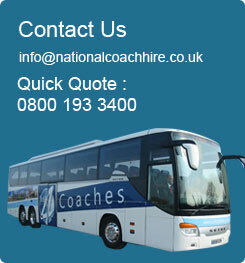 Wherever you want to go, National Coach Hire will get you there without any fuss. If you want to use Belfast as a base to explore the rest of Northern Ireland, then coach hire really is the best way to travel. Travel by coach to the summit of Cave Hill on the outskirts of the city, and look over the whole of Belfast and beyond. If you want to go further afield, either on day trips or for longer, then traveling by coach allows you to get the most from Northern Ireland’s stunning landscape; from the Victorian resorts such as Portstewart and the hundreds of untouched fishing villages and sandy coves, to the massive and awe-inspiring volcanic terrain of the Giant’s Causeway. Whether you want to hike or bike for the day in the Mountains of Morne, or go fishing in Lower Lough Erne, we can be there at the end of the day to whisk you back to your hotel. If you want to travel to or from Belfast, safely, quickly and with the flexibility to get the most from all of the surrounding countryside, then let National Coach Hire organize your trip.